“I can’t go to my other studio ’cause I’ll get shanked,” says Mike, who proves to us that he can sing Afro-swing melodies as well as he raps drill flows, while we talk by Young Urban Arts Foundation’s multimedia bus. His friends giggle awkwardly, two of them wearing rolled-up balaclavas, but he’s not joking. “I appreciate this bus because it’s warm, let me not lie! And being able to make music helps me direct my aggression.” As autumn has transitioned into winter during the final months of 2018, with the pavement getting wetter and trees barer, I have spent my Thursday evenings in Hoxton, London, delivering an outreach programme for the Young Urban Arts Foundation, or YUAF: DJ Mag’s charity of choice for 2018’s Best Of British awards. Our team at YUAF work in partnership with local authorities across London to engage young people in music workshops. 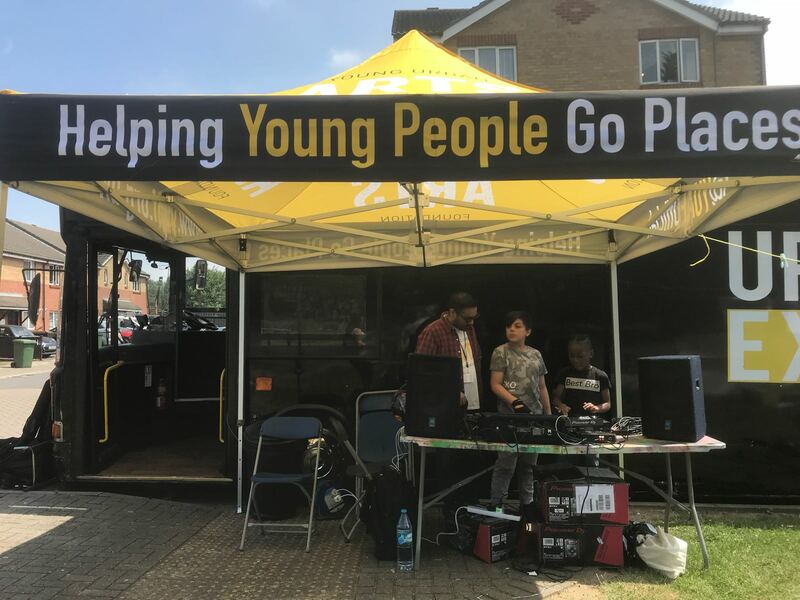 We drive a bus, which has a recording studio onboard, onto housing estates across the capital to provide a safe space for teenagers to learn the etiquette and practical skills involved in writing and recording music. The programme doubles as a cathartic opportunity to support young people with their mental health; in particular, those who disproportionately come from impoverished, unstable or stressful home environments. On the bus, participants are given the chance to express themselves on their own terms through singing, rapping, producing or simply tagging along and feeling part of a collaborative process. Across the series of workshops in Hoxton, myself and the rest of the team, sourced from YUAF’s extended family of educators, MCs, singers, DJs, producers and music industry professionals, worked with over 30 local teenagers. Groups of boys and girls, who would otherwise be standing around in the cold with little else to do in the absence of a nearby youth club, took turns to record verses over UK drill and rap instrumentals, or freestyle over the microphone we set up outside. In the controlled YUAF space, under the patient guidance of producer and singer Mister Lees, the studio sessions functioned not only as a medium through which the teenagers could benefit from caring, meaningful interactions with our team of trained adult staff, and work towards a shared creative goal — they were also a constructive way they could spend time, away from the hostile norm of London’s increasingly unsafe roads, as youth violence continues to spiral out of control. “I think when it comes to young people in society, there is a tendency to view them as distant, or as outsiders. And all that does is further push the gap between the different generations,” says Reveal MC, member of the legendary UK hip-hop crew Poisonous Poets, who is now pursuing a PhD in ethnomusicology at SOAS, University Of London. He is one of several lyric-writing mentors who helps deliver on YUAF’s bus, and he was there with me each week in Hoxton. “YUAF closes that gap by accepting young people as part of our common experience,” he continues. “There is an ‘it-takes-a-village-to-raise-a-child’ mentality that’s very prevalent in the YUAF philosophy and practice. There is also an underlying feeling of hope I get from working with them: no fear of confronting difficult stuff other organisations might shy away from. And that really comes from the way Kerry runs things. It’s a refusal to give up or accept things for how they are.” At the end of the penultimate workshop we delivered this winter (limited funding means running long-term programmes is increasingly difficult), an older MC from the estate called Shockerz, who had taken on the position of default leader in the studio, uploaded a song the group had recorded onto SoundCloud. By the final week, it had hit over 8,000 listens. The boys turned up early, smiling and eager to get recording again, addicted to the release the service gave them. I’ve spent the last two years reporting on the rise of drill music, specifically in London, and trying to push back against the censorship it is receiving from police who are eager to blame it for the capital’s knife crime epidemic in my writing. And I can safely say working for YUAF has given me the rawest evidence yet of how music, regardless of genre, can play a positive role in the lives of young people. For more info about the YUAF, including how to donate money to help their work, go to: yuaf.org.uk.